Deep in Midwinter, I remember Summers. Among those memories are wonderful visits with a long time dear friend from California, back when our children were younger. The summer Mike was 12, she came to visit with her first born, a beautiful, intelligent two year old, startlingly articulate for her age (but no surprise, since her Mamma is a prize winning writer). One of the most memorable phrases of that visit was her term “new favorite,” with the emphasis on new. As in, “This is my new favorite sweater,” and “this is my new favorite cookie” or my “new favorite blanket.” Beautiful dark-eyed sage that she was about things that comfort (and still is, just now a teenage sage), her precise intonation cued us all in to the essential wisdom that favorites change, like the seasons, so we are to enjoy them when they are here. I have long been a fan of miso soup. The very first time I learned of it, I was eavesdropping on a conversation another student in my yoga class was having with our teacher. “Do you like miso?” she asked our teacher. And then proceeded to explain how much she enjoyed having a cup before or after class. I had never heard of it. “Miso,” I thought to myself. Miso. And the door was opened to wonder about it. Then there was the fiction writer who rented us a house set back from the street when Michael was a toddler. She roller skated on the beach, and swore by miso. She told me there were different kinds and that she ordered hers from Gold Mine Natural Foods. A mutual friend said it would “survive the holocaust”—meaning it kept forever in the fridge. I was fascinated. When I first became mysteriously debilitatingly ill without a diagnosis other than “virus,” and couldn’t teach, let alone hold the phone to my ear, my long time herbalist friend had me make a big pot of brown rice, and another of vegetables cooked into their own self-made broth. I was to ladle each of these into a shallow bowl with a tablespoon of brown miso every day for lunch. It was a great comfort and, at the time, very easy for me to digest. When Mike and I took a thousand mile road trip to see my Dad in his last days a couple of years ago, I sustained myself for the long hours on the road with a cup of instant miso with seaweed. He’d bring me a hot water from the convenience store, and I’d drink it like a cup of coffee. Instantly I’d feel grounded and restored. I got him to try it, and even during those days of dedicated caffeine ingestion, he was duly impressed. So a couple of years ago when I realized that at this point even the “good soy” I had enjoyed so much seemed to be contributing to the fibromyalgia spikes in pain and inflammation, I was most crestfallen about saying good-bye to my beloved and comforting miso. I knew about and had liked the red miso made from barley, but earlier on cooked barley had declared itself too glutinous for me to continue digesting it comfortably. I thought I should be extra careful and eliminate the misos containing these as well. Since miso containing either soy or barley were the only ones my co-op carried, I thought my miso days were over. I read on the internet there was such a thing as chickpea miso, and then I found out there was also adzuki bean miso. But it cost more than the price of the miso itself to pay for the shipping to special order these, which, miso-deprived though I was, my inner cheap skate wanted nothing to do with. She saw an affordable opening when Mike and Kelly were coming for the holidays and prompted me to ask them to look for it in the grocery aisles of cosmopolitan Portland. And they found some. I had given them the brand name I had considered special ordering online. But they brought a different brand, Miso Master, which is one of the two brands our co-op carries. I asked if they would be able to bring in the chickpea version, and the answer was yes. So now I can be knee-deep, as it were, in vegan miso based soups and sauces once again. Today I’d like to share with you my “new favorite” miso soup. It’s perfect for midwinter. It shines orange and golden like the sun, with hints of green that promise the Spring that is to come. And it comforts like a winter fire. And it’s vegan, fat free, soy free, and, according to the ingredients on the container, there are none containing gluten. (Although the koji used is rice koji, I’m not sure about the koji spores themselves, or if it’s made in a completely gluten free facility. So those of you with celiac should inquire about these issues if you are concerned.) But as far as I’m concerned, that’s about as good as it gets. 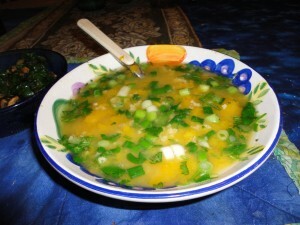 This soup doesn’t take long to put together at all, if you have already prepared a few of the key ingredients. Since I am always cooking up plain staples like this, it doesn’t seem like a lot of work to me. This recipe is a big soup bowl for one. Multiply as needed if you are serving others. Reheat your cooked squash and millet, either by steaming it for a few minutes, or by warming it in a slow oven or the microwave. Heat the broth in a small saucepan just almost to the point of boiling. 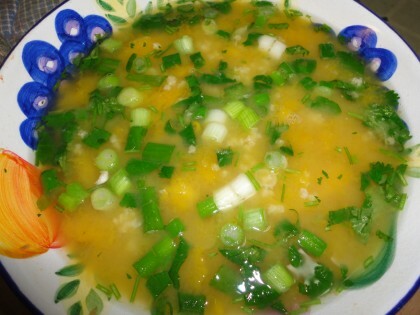 Put the tablespoon of miso in the soup bowl, along with the grated ginger. When the broth is about to boil, add a small amount of it (no more than a ¼ of a cup is necessary) to the miso and ginger and mix and mash until you have a nice paste. Let the broth in the saucepan continue to heat but not to a deep boil. Chop the green onion and the cilantro or parsley leaves. Add these to your soup bowl. When the millet and the squash are warm, add them to the bowl too. Finally, add the hot but not boiling broth. Mash and stir and enjoy. Now of course you can add all manner of things to this. I have added some of my dried mushrooms. I toyed with adding julienned carrots to the broth. But I like the 7 ingredient magic the way it is for now. For me, it’s just the right seven things. I hope you enjoy trying my new favorite soy free miso soup—maybe it will become a “new favorite” of yours too! Notes: I bake thin skinned winter squash like butternut, delicata, or even acorn by splitting them in half, and gutting out the seeds and goop (and putting those in my freezer bag full of veggie to make Everything But the Kitchen Sink Broth). I sprinkle these halves with garlic granules and put them face down on a cookie sheet or shallow pan lined with baking parchment. I bake them at 375 until the skin is soft to the touch and you can make a dent in it with your finger. If millet isn’t your idea of a culinary adventure, would brown rice work? Yes. Could cooked sweet potato be subbed in for the winter squash? I don’t see why not, though I haven’t tried it. It wouldn’t be my new favorite vegan gluten free miso soup anymore though. But then again, it might be yours. I’d check with the manufacturer if I were you but their website doesn’t say anything about the chickpea miso being gluten-free, just soy-free. Unless stated otherwise, it’s highly likely that barley koji was used to make the miso though hope I’m wrong! Thank you cv. I do not notice any adverse effects from it, and have not been diagnosed with celiac disease. The ingredients on the Miso Master container say rice koji, not barley koji. However, to be on the safe side,I will remove that gluten free claim from the post, in case it is made from barley. The other brand of chickpea miso I have seen was both, and it did not list a glutinous ingredient either. Thanks, Maria! I had no idea there was a soy-free, gluten-free miso! Can’t wait to get some and try your recipe. You’re welcome, Cheryl! I hope you enjoy the soup. I love miso too and get non soy/gluten varieties from South River, where they use brown rice koji. I make mine very veggie and mostly raw with red pepper flakes, bok choi, red peppers, snow peas, shredded zucchini, tomatoes, home sprouted mung beans, and mushrooms. Love it so very much winter, spring, summer, and fall. Your version of miso soup sounds absolutely delicious, too, Ginger. Thanks for reading and sharing. South River looks like a really good brand of miso indeed. Hi Mary Kate! Let me know how you like it. South River sounds like a good brand. There is no wheat or barley product listed in the Miso Master ingredients and for me anyway, so far so good.